This odd collection of notes and journal entries was left at the Champions' Guild by the adventurer and former tower wizard Ariane. The demon floats in its containment ward, magical fields gently but irresistibly moving it back to the centre whenever it shifts its weight. The ward reduces but does not entirely block the heat and the smell of sulphur. It looks down at me as I approach it, with an expression of such disdain and superiority that, for a moment, I imagine I am the one in the cage and it is free. Its voice is rasping, as if a collection of rusty swords were rubbing together to mimic human speech. "Small mortal," it says. "You interest me. You have a unique gift. I will speak with you." It's the first time the demon has spoken to me except to dismiss me. I think a part of me was hoping it would dismiss me again. I'm conscious that I'm breaking the tower's rules, but at this stage I can simply see no other way. I glance at the door, but the demon's keeper is nowhere to be seen. I say: "I want you to help me understand my gift." The demon is silent, peering down at me with eyes more ancient than I can imagine. "Wizard Ellaron said you would help me," I say. The creature chuckles at that. "He said no such thing." How does the demon know what Ellaron said? I dismiss the question: the reason I'm here is that the demon has channels of knowledge unavailable to me. I try to remember Ellaron's exact words. "Wizard Ellaron said that..." I realise he didn't say anything, as such. "He...implied." Another chuckle. "You did not always wish to control your gift. And there was a time when you would not have dreamed of disobeying the tower's rules." I don't know why the demon wants to mention that, but it's true. I've changed a lot in the last ten years. Today I said goodbye to my family and set off for my new home. I'm going to be an apprentice at the Wizards' Tower! I've still got the acceptance letter tucked away in my pack. The archmage said that my application essay was one of the strongest that she'd seen. Despite the fact that tower wizards invented the lodestone network, there's no teleportation lodestone on the tower island, so I travelled via Draynor. Draynor was gloomy, but as I walked across the bridge I emerged into bright sunlight. The tower is far taller than I'd imagined, made of white stone and adorned with statues of great wizards of the past. Standing at its foot I felt tiny. "The first Wizards' Tower was the lynchpin of human civilisation at the dawn of the Fifth Age of the World. It guarded the Rune Mysteries, the secret of making runes out of rune essence. From this impregnable island fortress, its wizards defended the fledgling human nations of Misthalin, Asgarnia and Kandarin from the attacks of monsters and barbarians." To think that, as I write this, I'm in the same building in which the art of Runecrafting was perfected! Grandma said I should tell them about my gift as soon as I arrive, but I didn't get a chance today. Back in the village, everyone thinks I'm the most powerful seer for a generation. Great-grandpa was a seer, and, when he visited the tower, all the wizards wanted to hear about his premonitions. I only have odd flashes of premonitions, nothing useful, but still, Grandma thinks the wizards will be interested. I'll tell them about it when I get a chance. I'm sharing a room with another apprentice, Caitlin. I didn't like the idea of sharing my space with someone, but she seems friendly. She keeps asking me all about myself. Lessons have been going on for weeks and we're still casting Air Strike at dummies. Frustrated. I wish we'd move faster. The other apprentices don't seem to like me. They stop talking as I come into the room. I don't know why! I haven't upset anyone. Have I? One of the senior wizards, Ellaron, has offered to take me on as his apprentice. He says he thinks I could learn more quickly if I weren't 'held back' by the other students. I think he's right. To Zamorak with the other apprentices, if they're going to hate me for no reason. I'd be better off working alone. Stupid, stupid, stupid. I should leave the tower now. I've found out why the other apprentices were shunning me. I'd told Caitlin about my precognitive gift, and it looks like she told everyone else. Some of them accused me of using the gift to cheat at tests. I tried to explain that I don't (even if I wanted to, I don't have that kind of control over it), but they wouldn't listen. Later on I realised they weren't really upset about the idea of cheating, but about the way they thought I'd done it. The whole ethos of the tower is that magic isn't something you're born with: anyone can learn magic if they put in the effort. But my gift, being a seer, runs in families. I didn't earn it, and they can never have it. No wonder they resent me. I thought they hated me for no reason but now it I realise it was my fault. I should have known better than to mention it to anyone. I'm going to ask Wizard Ellaron to help me suppress the gift. I don't want to stand out. I want to be a great wizard someday, but I want that to be because of what I can achieve on my own, not because of something I was born with. I talked to Wizard Ellaron today and asked if he'd help me suppress my premonitions. He's...talked me out of it. Instead, he wants me to keep the premonitions secret but keep a record of them. I shouldn't turn away a gift the gods have given me, he says. Even if I didn't work for the gift, I can still work with it. And if the other apprentices won't accept that, so be it. I'm better off working alone. I'm in a hot room that smells like rotten eggs. I can't see much, but I get the impression I'm still in the tower. A voice (my own, but older?) says: "Wizard Ellaron said that..." A pause. "He...implied." Another voice (indistinct--inhuman?) says something I can't easily make out. Then there's a flash of pain and a feeling of hitting a stone floor, as if a fire spell has knocked me off my feet, and the vision ends. A lot of my visions seem to include something painful. I wonder what it means. I'm expecting it and I've steeled myself, but the blast of pseudoflame still knocks me back a step. I don't fall, though, and in less than a second I'm back up to the edge of the ward and brandishing a half-formed spell in my palm. "Now then, let's have a civil conversation, shall we?" I say. I find I'm smiling with a new confidence. In the original vision I fell, but this time I didn't: I've changed the timeline across a distance of ten years. That's more evidence that my idea will work. "You dare threaten me?" the demon rasps. "I'm the one asking the questions, and you're the one in the cage." It's trying to intimidate me, but I won't let it. Wizard Grayzag's experiments have established that it can't do any real damage with its pseudoflame. It just does it out of spite; perhaps I looked like I was daydreaming just now and it wanted to get my attention. "You hide your fear well," it says. "You continue to interest me." "Can you help me control my gift?" I ask. "Can you help me see the future clearly?" It leans forward, bringing its inhuman face closer to mine. "What would you pay for this knowledge? Give me a drop of your blood - in so doing, pledge your allegiance to Zamorak - and I will give you the answer that you seek." I hesitate, half-deliberately. Even if I weren't nervous, it would be suspicious if I jumped at that offer. "You foresee a disaster," it coaxes. "You foresee it hazily, as though through mortal eyes, fallible balls of light and jelly. I can show you another possible future, as viewed through immortal eyes. I can show you a future in which you avoid the disaster you foresee. Surely that is worth the price I ask." I've been a full wizard for seven years now, and Archmage Sedridor tells me I'm well on my way to becoming a senior one. I can craft every known type of rune and cast almost every spell of the standard spellbook--but I have no more control over my visions than I had when I left home nine years ago! Pain is the key. Or, rather, intense sensations are the key, and pain is the one that can most reliably be created. The only pattern I can see is that every vision involves a powerful sensation. I need to be less squeamish in my experimentation methods. I have an idea. I tried my experiment today. I needed a second participant so I found Wizard Ellaron in his room. "Think of a number, and write it down," I said. "Don't show it to me." While he was scratching something on a wax tablet I produced the dagger from my belt sheath. I held it in my right hand, its point close to my upturned left palm. "I'm going to guess the number you wrote down," I said. "Once I've guessed, I want you to show it to me. If I get it wrong, I'm going to stab myself with this dagger. You must promise not to stop me." "It's a controlled experiment," I said to reassure him. "I've got a healing salve here with me." He broke into a smile. "You seem to have thought of everything. Go ahead." A vision came. A flash of pain in my hand, and the sight of a number on Ellaron's wax tablet. "Fifty-seven," I said. Ellaron's look of concern turned into one of disbelief. He handed me the wax tablet; it had '57' scrawled in bold numerals, exactly as I'd seen it in the vision. "You read my mind," he said. He sounded shocked and a little angry. I tucked the dagger back into my belt and rubbed my undamaged hands together in front of me. "I looked a little way into the future," I said. He smiled; I think he understood what I'd just done. "And the knife?" "I didn't need it in the end." I've been able to repeat the dagger experiment several times, with Ellaron and with other assistants, but I haven't been able to improve on it. After all this work, all I've achieved is a parlour trick. Perhaps with a more intense pain I could use the same trick to see further into the future, but I don't know if I have the willpower. In order for the trick to work I have to absolutely intend to inflict pain on myself if it fails. Meanwhile the vision of the tower in flames gets more intense every time I see it. I only wish it would get more detailed! I told Archmage Sedridor about it, but he said he couldn't do anything unless I could give him more specific information. His only advice was for me to pray to Saradomin for guidance. I prayed to Saradomin, as the archmage suggested. There was no response that I noticed. 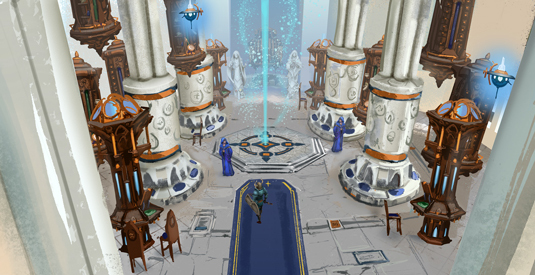 I went to Taverley and tried praying at a shrine of Guthix: again, no response. I'm running out of options. What is your answer?" the demon asks. "Is the solution to your problem worth a drop of your blood and your pledge of allegiance to Zamorak?" I hold the dagger in my right hand, its point close to my upturned left palm. I can feel my heart pounding. "If I draw blood now," I say, "you will take it as a pledge of allegiance to Zamorak. Correct?" The demon hisses through a hideous, tooth-filled smile. "Yes. A single drop, and you are bound." "And you will tell me the answer immediately--in that moment?" I move the dagger away from the sweat-speckled but unbroken skin of my left palm. "You hesitate?" the demon scoffs. "You will not give me a single drop of blood?" I put the dagger back into its sheath. "I didn't need to in the end." The demon lunges forward, exhaling hot sulphurous breath into my face before the ward pulls it back. I turn, calmly, and walk away. As I do so, I steel myself for another spiteful blast of pseudoflame. I don't know whether it understands exactly what I've done, but it knows it's been tricked. No pseudoflame comes. Instead, it bellows behind me so loud that its voice must fill half the tower, "Hail, worshipper of Zamorak! Your allegiance is gladly accepted!" I hear a shout and footsteps running towards me. Xenia has arranged for me to have lodgings in the Champions' Guild until I find a new home. Archmage Sedridor believes I'm a Zamorakian demon-worshipper and has expelled me from the tower. I'll have to get used to not putting 'Wizard' in front of my name. I had the vision again last night, more intense than ever. I'm sure it's close--within the next few days. I'm going to head back to the tower once I've finished writing this. l don't know what I can say besides "The tower is in danger and I don't know why," but I've got to try. I think I know how to prevent the disaster, though. The new vision I tricked out of the demon let me see another possibility. Something floats in the centre of the tower, a great wave of magic rising up--but then it subsides, the problem solved, and the tower is safe. The only other difference I can see between the visions is that there's someone else there in the library. I can't see what they're doing, but they're calm, competent, not panicking. An adventurer. The phrase I heard the demon say confirms that, echoing down from an orphaned future in which I pledged my blood to Zamorak. "Solitude is your downfall, small mortal. If you wish to prevent the disaster you foresee, you must not work alone." I've worked alone for the last ten years and I don't know whom I can turn to now. I don't even know what I need help with. I just have to hope I'll find someone who's up to the task.